ceiling height is no higher than 15 feet, assembly areas, enclosed smoking areas, building construction where "localized" temporary heat is needed, and repair stations are just a few examples of where BDH Series portable blower heaters can be used. 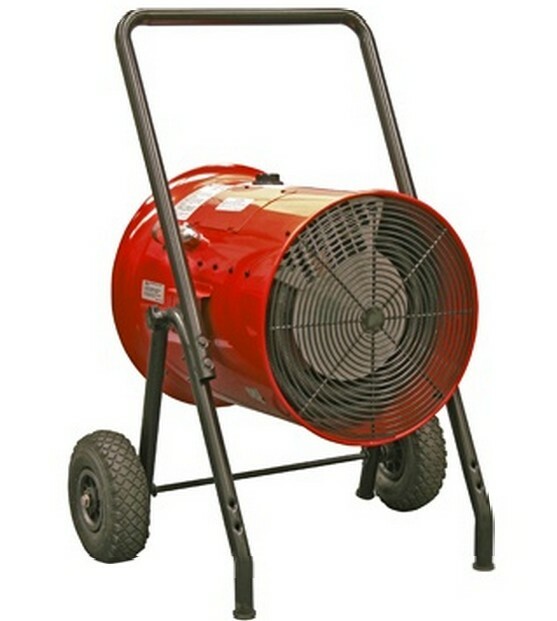 The BDH Series portable electric blower heater is an excellent choice to heat areas that are indoors and enclosed with ceiling heights of 15 feet or less. The brightly painted heater enclosure is a structural frame consisting of two spun rings and two formed channels that support a 20 gauge steel cylinder. The enclosure is phosphate coated for corrosion resistance, and finished in powder coat paint. The heating cylinder pivots vertically to direct airflow. The BDH Series has five wattage outputs to choose from and starting as low as 7.5KW. The built-in safety features include an adjustable thermostat (range 40°F to 100°F) to control the outlet air temperature, auto-reset thermal cutouts for the fan motor and heating elements. The thermostat provides settings for full OFF, fan only, and temperature control in the heating setting. black powder coat and are designed to meet OSHA safety requirements. High BTU per hour heater without the exhaust fumes or moisture associated with gas heat. Comfort heating and process heating application up to 180° F. Can be operated unattended without risk of fire or need for refueling. Fan-only operation for air recirculation, fume exhaust, or fresh air supply. Dual thermostat operation. 120 volt control supply. 120 volt control transformer with pilot light. Over temperature limit protects unit from low air flow conditions. Powder coated corrosion resistant 20 gauge steel housing. 10" pneumatic wheels and 4" locking caster. Inlet and outlet flexible duct accessories available for ducting up to 165'. Adjustable damper accessory allows outlet temperature to be controlled. High BTU per hour heater without the exhaust fumes or moisture associated with gas heat. Comfort heating and process heating application up to 180° F. Can be operated unattended without risk of fire or need for refueling. Fan-only operation for air re-circulation, fume exhaust, or fresh air supply. Dual thermostat operation. 120 volt control supply. 120 volt control transformer with pilot light. Over temperature limit protects unit from low air flow conditions. Powder coated corrosion resistant 20 gauge steel housing. 10" pneumatic wheels and 4" locking caster. Inlet and outlet flexible duct accessories available for ducting up to 165'. Adjustable damper accessory allows outlet temperature to be controlled. NOTE: BDH1021CKB Includes cord & plug kit packaged inside heater carton.